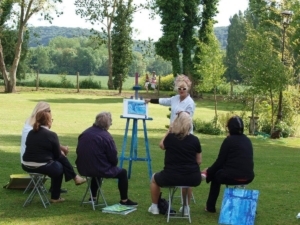 I’ve had the rare privilege of participating in Art Colony Giverny as an instructor. 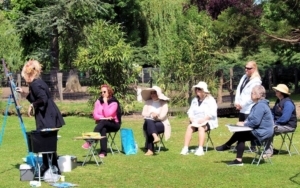 It’s incredibly inspirational just to paint in Monet’s gardens, but getting to share the art of impressionism with up to eight eager students is absolutely, positively priceless. There is an element of discovery in all artistic creation. Sometimes, the motif reveals secrets as the artist transfers the image or impression from the outer world to the artist’s canvas, cardboard or other support. 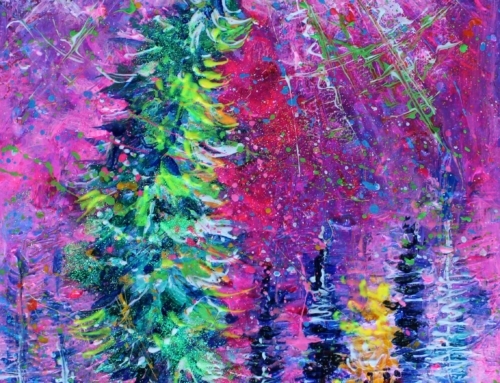 Sometimes we discover a previously unknown aspect about the process of painting, whether it involves mixing colors, applying pigment or pushing the paint across a smooth or textured surface. And at other times – those rarified and treasured occasions- we learn truths about ourselves and our relationship with the God and the universe. When you add six, seven or eight students to the mix, a group dynamic also takes place. Sure, students learn beaucoup from me, but we all learn from each other because of the fact that we each bring our own constellation of experiences to the canvas – our own unique way of seeing things and perceiving the world. 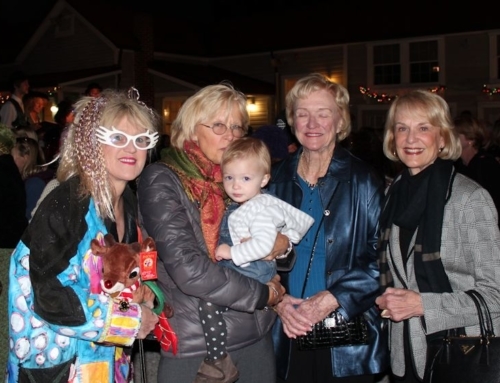 And then there’s the after-glow. 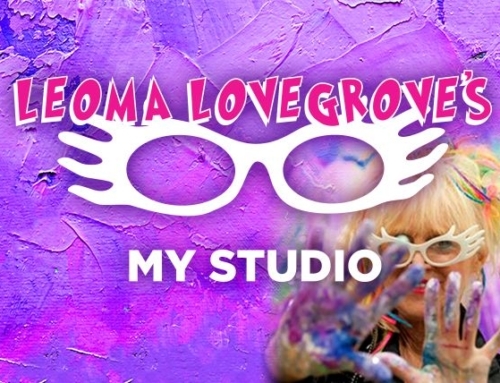 That’s the phenomenal feeling you experience when you’ve given yourself over to your creative impulses and you look, with satisfaction, at the masterpiece you’ve just created …. 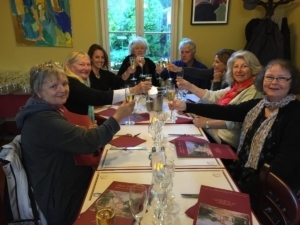 Especially in an environment as supercharged as Monet’s gardens – and especially because you’ve gotten to experience these hallowed grounds without anyone else around. That’s right. 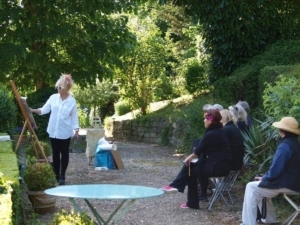 Art Colony Giverny classes take place after the gardens close at 6:00 p.m. Imagine going into the gardens as VIPs, setting up your easel facing Monet’s famous Japanese bridge. 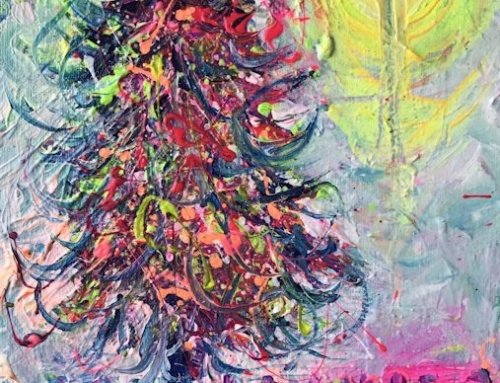 You squeeze out the paint on your palette – two reds, two yellows, two blues and white. 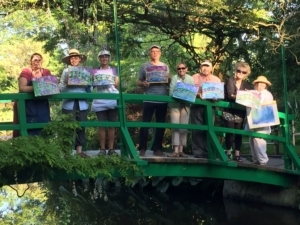 Then we paint for an hour or so, sign the finished work, dip our brushes in the lily pond and pose for a group photo before saying au revoir to Claude Monet’s presence beneath the weeping willow. By 8:00, we’re done and out of there, ready for our well-deserved glass of Chardonnay. And that’s what has transpired during my previous Art Colony Giverny experiences, and what I expect from the next in 2018. If you would like to paint Monet’s Japanese Bridge with me in Giverny, sign up on my website for dates and times. This will be next spring. April-May 2018.